The extradition of Ratko Mladic to the Netherlands for trial on genocide charges is particularly poignant. The Dutch have a special interest in bringing him to justice because of their role - some would call it complicity - in the Srebrenica massacre. More than any other nation, the Netherlands - whose peacekeepers failed to protect Muslim refugees in Srebrenica - has agitated for his arrest. His detention has, therefore, sparked a collective sigh of relief here. But, for some, it has also revived a deep shame that remains in the Dutch conscience. Dutch Foreign Minister Uri Rosenthal called the news of Mladic's arrest "happy and historic". He spoke of "redress" for both the relatives of the victims and the Dutch battalion of UN soldiers (Dutchbat) that proved unable to defend the "safe haven" of Srebrenica. 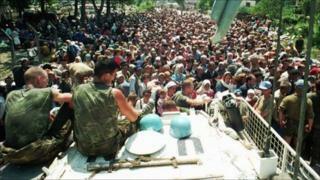 More than 7,000 men and boys were killed there, after it was overrun by Gen Mladic's forces. "Dutchbat suffered too," he added during a TV debate, referring to the disorders that afflict many veterans. Delight over the arrest is still tempered by the collective trauma Dutch society suffered from Dutchbat's failure. The NRC Handelsblad daily warns that Gen Mladic's trial in The Hague will not "close the book on Srebrenica". It is perceived as a salve to ease the pain from Dutchbat's actions. Deputy Prime Minister Maxime Verhagen, who blocked Serbia's admission to the EU as long as Gen Mladic remained at large, tweeted: "The Netherlands can be proud of our continued insistence that Mladic be brought to The Hague." The media seems to be responding by presenting the role of Dutchbat in a milder light. Anne Mulder, a member of the Lower House and Dutchbat veteran, described how he was tortured by feelings of powerlessness. As Dutchbat pulled out on 21 July 1995, 10 days after the fall of the enclave, he realised he could have shot Gen Mladic: "I had my Uzi on my lap. We left. Looking back, we realised that we were all armed and he was standing right there." His memory contrasts sharply with footage from that moment, showing a cheerful Gen Mladic presenting Dutchbat commander Thom Karremans with going-away presents (including a lamp). "Is this for my wife?" asks a smiling Lt Col Karremans. For the second time in 10 days, he and Gen Mladic raised a toast to peace. At his arrival in Zagreb, the Dutch commander spoke to the press about his "colleague" Gen Mladic. "From the Serbian side, the capture of Srebrenica was a correct military operation," he said. "Mladic did a good job of out-manoeuvring us." He refused to call him a war criminal. The Dutch reporting of Gen Mladic's arrest does not dwell on such moments. Now that "the real villain" has been caught, the painful aspects of Dutchbat's performance are scarcely considered. Nobody seems willing to be reminded, for example, of the intense loathing many Dutchbat soldiers had developed for the refugees they were supposed to protect - nor of the fact that troops manning a number of Dutchbat observation posts on the edges of the enclave surrendered without the slightest resistance. When the enclave fell and some 25,000 refugees crowded into and around the Dutchbat compound, fleeing Dutchbat soldiers panicked. The battalion command refused to give the 18-year-old brother of interpreter Hasan Nuhanovic a UN pass. He had to leave the compound and was murdered by Gen Mladic's troops, together with his father and mother. The official 2002 Dutch investigation by the NIOD Institute for War, Holocaust and Genocide Studies concluded that Dutchbat could not have prevented the enclave from falling, that the air strikes requested did not come in time, and some units did put up a fierce resistance. The report, though, was critical about the failure of Lt Col Karremans to inform his superiors about the human tragedy witnessed by the battalion - such as the bodies his men saw along the stream outside the compound. It also concluded that the Dutch army command had pursued a hush-hush policy in an attempt at damage limitation. After returning to the Netherlands, Lt Col Karremans was paraded in a Cadillac convertible and later promoted to colonel. In 1998 he told NRC Handelsblad: "When the Dutch team loses in the World Cup semi-finals, the country's fed up for a day. But we, the men and women of Dutchbat, we still get the cold shoulder three-and-a-half years after the fall of Srebrenica." Immediately after the publication of the official NIOD-findings in April 2002, the Dutch government resigned, taking "responsibility" for what had happened, but "not the blame". Dutch governments have since been harsher than others in Europe in trying to get ex-Bosnian Serb leader Radovan Karadzic - captured and sent to The Hague in 2008 - and Gen Mladic to justice. During a TV debate on Thursday, almost 16 years after the bloodbath at Srebrenica, Col Karremans described Col Mladic as "a hardliner, someone you couldn't do business with". Asked whether he held him responsible for the death of so many Muslim men, he said: "Absolutely, yes." As he spoke, the channel replayed the footage of his forced "toast" with Gen Mladic on 11 July 1995. The Dutchbat commander was humiliated. In the clip, he was heard saying: "I am a piano player, don't shoot the piano player." Gen Mladic: "You are a lousy piano player." These images have dented the nation's sense of itself. They won't be dislodged easily.